In the previous chapters, we focused generally on single neurons, small populations of neurons, and the occasional array of neurons. With the advent of multielectrode recording, intrinsic imaging, calcium imaging, and even functional magnetic resonance imaging, it is becoming possible to explore spatiotemporal patterns of neural activity. 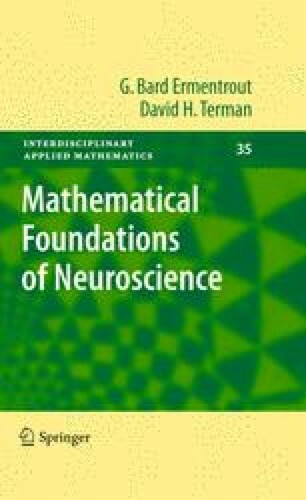 This leads to a wealth of interesting fodder for the mathematically inclined and it is the goal of this chapter to provide some examples of this type of analysis. In Chap. 6, we looked at the propagation of action potentials down an axon; this is modeled as a partial differential equation. By looking for traveling waves, we were able to reduce the equations to a set of ordinary differential equations. When neurons are coupled together with chemical synapses, the natural form of coupling is not through partial derivatives with respect to space, but rather through nonlocal spatial interactions such as integral equations. In Sect. 8.4, we also looked at such models under the assumption that there is a single spike wave, much like an action potential. As with the partial differential equations, it is possible to look for specific forms of a solution (such as traveling waves or stationary patterns), but the resulting simplified equations do not reduce to ordinary differential equations. Thus, new techniques must be developed for solving these equations and (if desired) proving their existence and stability.